A lot of younger faces are introduced to this new film (Underworld: Blood Wars), in the hopeful attempt to bring in a more youthful audience to the series as most of their fans have grown up. In 2003, a relatively unknown actress, Kate Beckinsale (Pearl Harbor), along with director Len Wiseman (Total Recall), created a new gothic/steampunk/action/sci-fi franchise entitled Underworld. Since then, we have been treated to various adventures in a world dominated by Vampires and Lycans and now, in 2017, Sony Pictures and Screen Gems have unleashed their latest outing in the series, Underworld: Blood Wars. Selene (Beckinsale) has gone through a lot of changes since the beginning of the series. A Romeo and Juliet style romance, a physiological change to becoming one of the strongest vampires that has ever walked the earth, and the birth of a daughter. This time, she is fighting for her own life as the repercussions of what she did in the first film are still catching up to her. With only two Vampire covens still existing in the world, and the Lycans growing stronger every day, Selene is running out of options. Her self-appointed partner David (Theo James; The Divergent Series) from Underworld: Awakening and his father are her only two allies in a world where the Lycans are after her and her daughter for their blood and the vampires want her dead for revenge. David's father, Thomas (Charles Dance; Woman in Gold) is able to broker a deal that allows Selene sanctuary for her crimes in return for her teaching a new set of Death Dealers the skills they need to combat the Lycan threat now headed by the powerful Marius (Tobias Menzies; Outlander). However, with enemies beset on all sides Vampires and Lycans alike time might have run out for Selene. A lot of younger faces are introduced to this new film, in the hopeful attempt to bring in a more youthful audience to the series as most of their fans have grown up. However, in doing so, they risk alienating Underworld's core audience that has been supportive of the past films. Evidence of this "rebranding" was seen in the last film Underworld: Awakening but can be seen to a fuller extent this time around. While these young actors might draw new viewers to the series, they also have changed the films from being action/horror fare to more of a soap opera that you would find on the CW network. Aside from the younger cast brought into the series, Underworld: Blood Wars also boasts a new director, Anna Foerster (Outlander). She has the honor of being the first female director in the series, which is a nice change of pace considering that Beckinsale's character is a poster child for female-centric action films. She does an amazing job with what she has to work with. The action scenes are all top notch, as well as the special effects, and overall editing of the film. However, she can only do so much with what is a very lackluster script by Kyle Ward (Machete Kills) and Cory Goodman (The Last Witch Hunter). Presented in 2160p the Underworld series has never looked better on a television screen. The color palette has never blended more perfectly with the look and feel of the film. 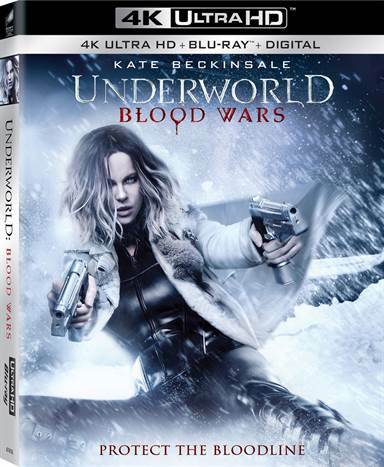 However, one drawback is that with 4K UHD image showing deeper and truer blacks than it's 1080p counterpart, Underworld: Blood Wars is very dark and, at times, one has a hard time seeing what is going on in the film, especially during very chaotic battle sequences. On the audio side, Underworld: Blood Wars is presented in Dolby Atmos with a very sharp soundtrack that has crisp dialog and great sound effects. The Evolution of Selene: Look back at the past films and the incidents that shaped Selene to the character she is today. Old & New Blood: A Look at some of the elder vampire characters of Underworld: Blood Wars. The Evil Evolved: A look at all the villains portrayed in Underworld: Blood Wars. Building a Blood War: Main featurette delving deeper into the direction, special effects, set design, and more of Underworld: Blood Wars. Underworld: Blood Wars Graphic Novel: A still image graphic novel based on the film. Even on a 55" 4k television monitor, it is very hard to read and I am not sure why it was even included like this instead of a digital copy of the graphic novel itself that could be read on a smartphone or tablet. While Underworld: Blood Wars is not the best in the series, it is certainly not the worst. It is a vast improvement over Underworld: Awakening, but it is certainly not on the same level as the original films in the series. It's a mixed bag, at best, so it will be interesting to see what the producers' next move is and if Beckinsale will return once more to this beloved character. Download Underworld: Blood Wars from the iTunes Store in Digial HD. For more information about Underworld: Blood Wars visit the FlickDirect Movie Database.